From the Veterans Expressway take the Linebaugh Exit. West to Sheldon. Turn North on Sheldon and the Entrance to Terracina Lakes will be on the right. First home on the left. Hello, I’m interested in 8757 Terracina Lake Dr and would like to take a look around. 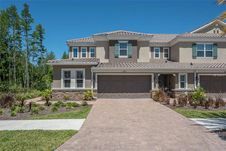 The details on 8757 Terracina Lake Dr: This house located in Citrus Park Community, Citrus Park, FL 33625 is currently for sale for $409,900. 8757 Terracina Lake Dr is a 2,368 square foot house with 3 beds and 2.5 baths that has been on Estately for 8 days. 8757 Terracina Lake Dr is in the Citrus Park Community neighborhood of Citrus Park and has a WalkScore® of 36, making it car-dependent. This house is in the attendance area of Smith Middle School, Sickles High School, and Westchase Elementary School. Listing Courtesy of: MFRMLS and SUNSHINE R.E. OF TAMPA BAY LLC.